The presidential race had barely gotten off the ground when it became clear that 2012 would be the year of the Super PAC. The millions of dollars raised and spent by these strange and powerful court-created entities have created a kind of parallel campaign. Super PACs represent much of what is wrong with American democracy rolled neatly into one package. They are tools that powerful special interests and a tiny privileged minority can use to work their will by drowning out the voices of ordinary Americans in a sea of (sometimes secret) cash. We do not yet have nearly the full picture of how Super PACs have affected and will continue to affect the 2012 elections. Right now, we only have a complete picture of the year 2011. But, we can already see some disturbing trends. For-profit businesses use Super PACs as an avenue to influence federal elections. 17% of the itemized funds raised by Super PACs came from for-profit businesses—more than $30 million. Because Super PACs—unlike traditional PACs—may accept funds from nonprofits that are not required to disclose their donors, they provide a vehicle for secret funding of electoral campaigns. 6.4% of the itemized funds raised by Super PACs cannot be feasibly traced back to an original source. Super PACs are a tool used by wealthy individuals and institutions to dominate the political process. 93% of the itemized funds raised by Super PACs from individuals in 2011 came in contributions of at least $10,000, from just twenty-three out of every 10 million people in the U.S. population. Democracy is a system for people of equal worth and dignity to make decisions about collective self-government. Elections are the most concrete locus of popular decision-making in a representative democracy. Contrary to the Supreme Court’s Citizens United ruling, for-profit businesses should not be permitted to spend treasury funds to influence these elections. First, most businesses are constrained to participate only to maximize private profit, rather than out of regard for the public good. More important, this spending undermines political equality by allowing those who have achieved success in the economic sphere to translate this success directly into the political sphere. Yet, Super PACs have provided a convenient avenue through which more than 566 for-profit businesses have contributed $31 million, accounting for 17% of total itemized Super PAC fundraising since their inception. For the year 2011, that figure was $17 million, for 18% of total itemized Super PAC fundraising (See Figure 1). But, Super PACs have provided an avenue for secret money to influence elections. Our analysis of FEC data shows that 6.4% of the itemized funds raised by Super PACs since 2010 was “secret money,” not feasibly traceable to its original source. (See Figure 2.) That figure was just below 2.4% for the off-year of 2011. Without data for a complete election cycle, it is difficult to analyze the overall trend and effect of secret money. One reasonable hypothesis is that secret money will increase with proximity to an election. See Figure 3 for money-by-month analysis that provides some support for this supposition. An important question is whether the amount of secret money will rise dramatically in the current election year. Given the spike in secret spending right before the 2010 election, and rate at which secret money has increased month to month in 2011 versus in 2010, it is reasonable to expect that in the months leading up to the 2012 election we will see secret money flowing int Super PACs at unprecedented rates in 2012. But, traditional PACs, which may make independent expenditures or contribute directly to candidates or parties, may only accept contributions that can be traced back to an individual donor.23 Super PACs, on the other hand, may accept contributions from a wide range of sources—including sources that are not required to disclose all of their funders. Our analysis of FEC data shows that 5.6% of all itemized Super PAC money came from 501(c)(4) corporations and that 19.1% of all active Super PACs received some portion of their income from 501(c)(4) corporations. For 2011, 12.5% of Super PACs received 501(c)(4) money, accounting for 2.1% of total itemized receipts. Another portion of untraceable money we found in some Super PACs came from other Super PACs that had raised money from an untraceable source. Given that these donations were eventually traced back to their original sources one might argue that they are not “untraceable” (and we treated them as traceable for the purposes of our analysis). But, it appears that certain corporations exist not to conduct regular business but rather simply to necessitate an extra layer of research to discover the true source of contributed funds. This reduces the ability of average citizens to understand the mo- tivations behind the money—an important interest served by disclosure. Long before the courts created Super PACs, financing political campaigns was, by-and-large, a rich person’s game. Super PACs have made a bad situation worse. Now, a billionaire who wishes to help a friend, associate, or ideological ally get elected to federal office can contribute an unlimited amount to a Super PAC closely aligned (although not technically coordinated) with her favorite candidate’s campaign.39 We have already seen some examples of this in the presidential primaries. In addition the “merely rich” can make their voices heard loud and clear by contributing $20,000, $50,000, or $100,000 to a Super PAC with the sole purpose of influencing a single election—drowning out the voices of average citizens and giving the candidate or candidates they sup- port a much better chance to win. 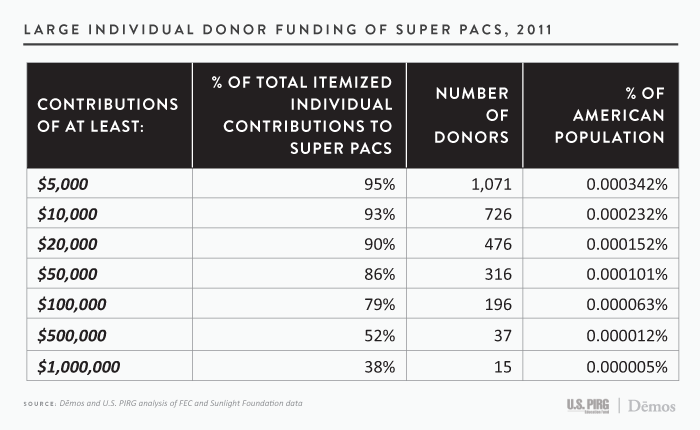 Our analysis of FEC data on Super PACs for 2011 reveals the disproportionate influence of the wealthiest donors. 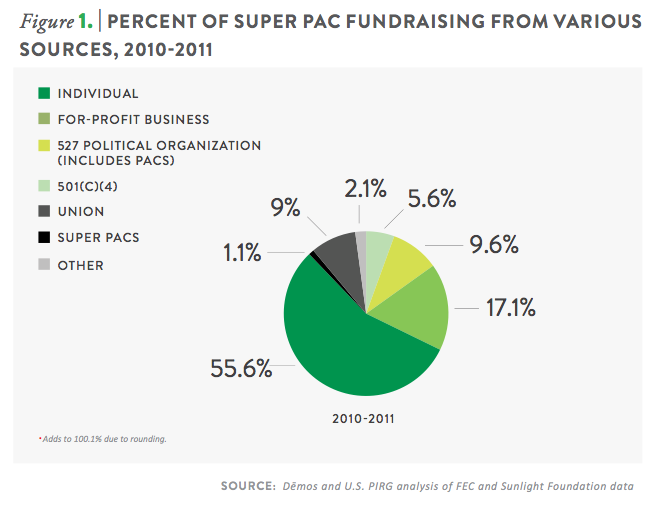 Super PACs raised 56% of their itemized funds from individuals since their inception in 2010. The average itemized contribution from an individual to a Super PAC in 2011 was $8,460.40 For 2011, these figures where 65% and $21,380 respectively. Our analysis of FEC data shows that a tiny minority of wealthy individuals and institutions is responsible for the vast majority of funds raised by Super PACs. Why, exactly, is this a problem? There are three major reasons. The primary danger of our big money electoral system is that it gives a very small number of wealthy individuals and institutions vastly outsized influence over who wins elections and therefore who makes policy in the United States. Raising and spending money directly is not exactly the same as having money raised and spent on one’s behalf. But, as Newt Gingrich’s lifeline from Sheldon Adelson44 and Stephen Colbert’s stinging satire have so compellingly demonstrated in recent weeks, lax FEC regulations have virtually collapsed the distinction. This means that Americans who can afford to give thousands of dollars to political candidates or Super PACs that support them are more likely to see candidates who share their views on the key issues of the day win office and assume positions of power. This is the influence of money on elections, rather than on politicians. Wealthy contributors helping their favored candidates win elections would not systemically skew politics or policy outcomes if these well-heeled donors were like the rest of us, if on average they had the same life experiences, opinions about issues, and political views as average-earning citizens. But, unsurprisingly, this is not the case. We have long known that large campaign contributors are more likely to be wealthy, white, and male than average Americans. 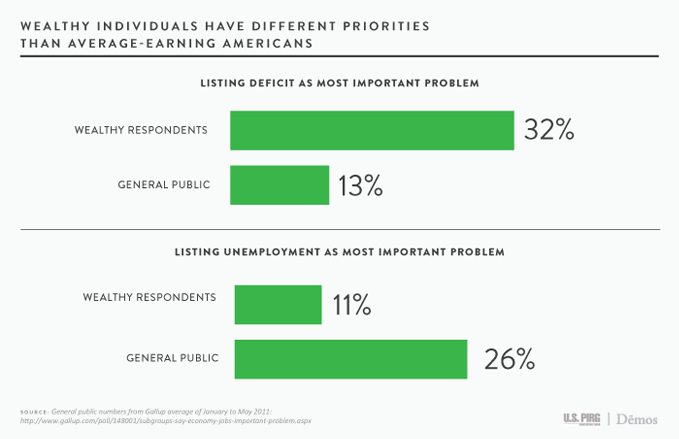 And recent research confirms that wealthy Americans have different opinions and priorities than the rest of the nation. A recent report by the Russell Sage Foundation confirms this finding. The authors surveyed “a small but representative sample of wealthy Chicago-area households.”52 They found meaningful distinctions between the wealthy respondents they surveyed and the general public on economic issues such as the relative importance of deficits and unemployment. 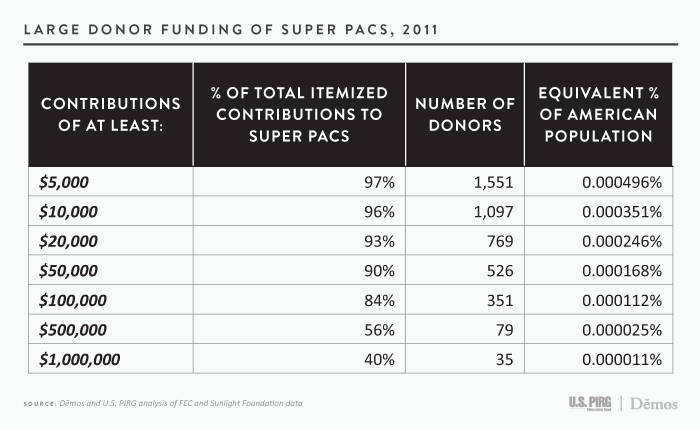 Our research shows that Super PACs are truly kryptonite for our democracy. They are tools used by for-profit business and big donors to translate economic success into political gain—sometimes in secret. This undermines basic principles of citizen sovereignty and political equality, and can rob voters of the chance to evaluate political messages in light of the messenger. In the following section we provide recommendations to different federal, state, and local actors for mitigating the influence of Super PACs. Tighten rules on coordination. As noted above, current rules prohibiting coordination between Super PACs and candidates are riddled with loopholes. The Federal Election Commission should issue stronger regulations that establish legitimate separation between candidates and Super PACs. For example, the Commission could prevent candidates from raising money for Super PACs; prevent a person from starting or working for a Super PAC supporting a particular candidate if that person has been on the candidates’ official or campaign staff within two years; and prevent candidates from appearing in Super PAC ads (other than through already-public footage). Propose a constitutional amendment to clarify that Congress and the states may regulate individual and corporate political contributions and spending. The only complete solution to the problems presented by Super PACs is to amend the U.S. Constitution to clarify that the First Amendment was never intended as a tool for corporations and the wealthy to dominate the political arena. Tighten rules on coordination. If the FEC refuses to act, Congress can pass legislation codifying the com- mon-sense rules recommended above. Protect the interests of shareholders whose funds may currently be used for political expenditures without their knowledge or approval. Congress should require for-profit corporations to obtain the approval of their shareholders before making any electoral expenditures; and require any for-profit corporation to publicly disclose any contributions to a 501(c)(4) organization that either makes an independent expenditure or contributes to a Super PAC. Pass or maintain state laws preventing direct corporate spending on elections. The Montana Supreme Court recently upheld the state’s longstanding prohibition against corporate spending on elections by distinguishing Montana’s specific history of corporate-driven political corruption from the factual record considered by the U.S. Supreme Court in Citizens United.64 State legislatures should build an extensive factual record to support new or existing laws that protect the rights of their citizens and safeguard their democracies from corporate takeover. Pass resolutions calling for a constitutional amendment. States should urge two-thirds of the House and Senate to propose a constitutional amendment by passing resolutions calling for such a step. Enact corporate disclosure and shareholder protection provisions. Corporations are chartered in the several states and as such states can use their authority to require the protections recommended for Congress above. Although municipal governments have no formal role in the constitutional amendment process, they provide a good outlet for citizens to express their strong sentiment that Congress must propose an amendment. New York, Los Angeles, and other cities have passed resolutions calling for a constitutional amendment, and more cities should follow suit. 17. Citizens United at 916. 19. Citizens United at 619. Citizens United did not create Super PACs on its own, but its logic paved the road. 20. We consider a Super PAC “active” if it has raised any amount of money. 23. Political committees may accept contributions from individuals or other political committees—so each contribution must start with an individual. 27. There is a current lawsuit pending to force the FEC to require nonprofits that conduct electoral spending to disclose their donors: http://www.democracy21. 28. Citizens United at 916. 29. For a more detailed explanation of how we determined which funds were or were not traceable see our methodology section. 34. Adam Lioz, The Role of Money in the 2002 Congressional Elections, U.S. PIRG Education Fund (2003). permitted to pool this money with other donors through the use of a political committee. exact actual number of donors. 46. John Green, Paul Herrnson, Lynda Powell, and Clyde Wilcox. Individual Congressional Campaign Contributors: Wealthy, Conservative and Reform-Minded (1998). 52. Benjamin I. Page, Fay Lomax, Cook, and Rachel Moskowitz, Wealthy Americans, Philanthropy, and the Common Good, September 25, 2011 at 6; available at http://www.scribd.com/doc/75022549/Wealthy-Americans-Philanthropy-and-the-Common-Good. 61. Thomas Cmar, Towards a Small Donor Democracy: The Past and Future of Incentives for Small Political Contributions, U.S. PIRG Education Fund (2004). 63. See Bruce Ackerman and Ian Ayres, Voting with Dollars: A New Paradigm for Campaign Finance (2002).